This is a political poster from the 1978 election for state comptroller. It belongs to John Castle who ran as Republican nominee that year and appears to be the incumbent. Castle lived in Dekalb, and he was chairman of the Sandwich State Bank. He also worked in the Governor Thompson Administration. Castle was also a graduate of Princeton. Not much is known about Castle's political career after 1978; a recent newspaper article indicates Castle maintained ownership of the DeKalb County Journal and backs the Republican Party there in local elections. Castle lost the 1978 election to Roland Burris, graduate of Southern Illinois University, who became the first black to work in a major elected office in the history of the state of Illinois. Castle's value to the History Harvest collection is to defining local politics. He is a strong business leader and organized political leader in the community, He has made DeKalb more recognizable while working in state government on state issues. Not much indication is provided to understand what the poster meant to David Farrell, its contributor. Similarly, sources indicate that Burris questioned Castle's ethics by constantly using his picture in TV adds to associate his race with being unfit to run for political office according to the Chicago Tribune. 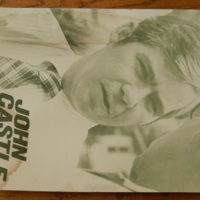 “Political Poster for John Castle Running in Illinois Comptroller Election of 1978,” UIS History Harvest, accessed April 19, 2019, http://uishistharv1.uis.edu/items/show/218.